Exclusive 12, 8, 5 or 3 Easy Payments on Line 6 Helix LT Modeling Electric Guitar Processor only at AMS! Free 2 Day Shipping & Free Extended Warranty. Call our Gear Experts at 800-319-9043 for expert advice! 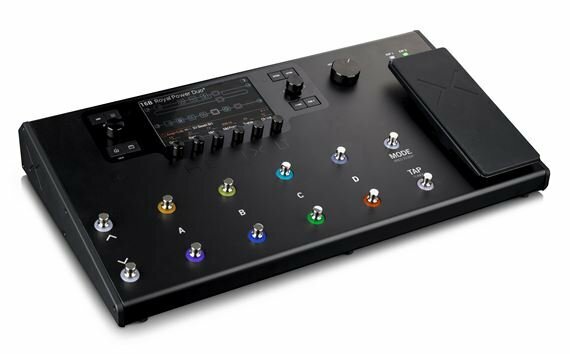 If you’ve been blown away by the world’s most powerful guitar processing platform, the Helix, but were hoping for something a little more pocket-friendly, say hello to the Line 6 Helix LT. Retaining everything that is cool about the Helix Floor and Helix Rack, the Helix LT sports the same breakthrough dual-DSP Modeling engine (with multiple awards under its belt) to faithfully reproduce as comprehensive a range of spectacular amps, cabs, mics and effects as you’ll find. The Helix LT boasts the best-in-class dual DSP HX modeling engine to generate convincing replications of your favorite amplifiers without flinching. Great pains have been taken to simulate the function and responsiveness of every component, guaranteeing the satisfying aural experience of accurate recreations. The massive dual DSP engine facilitates effortless emulation of an extensive array of amps, cabs, mics and effects with ease and precision. 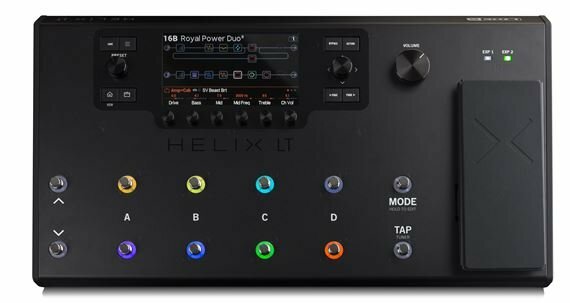 And if you like to put your own sonic stamp on your tone, Helix LT allows loading of custom impulse responses to sculpt your sound. Like its namesakes, the Helix Floor and Helix Rack processors, the Helix LT interface is pretty easy to navigate, especially when you consider the complex routing scenarios available for each patch. And what could be easier than hands-free programming? 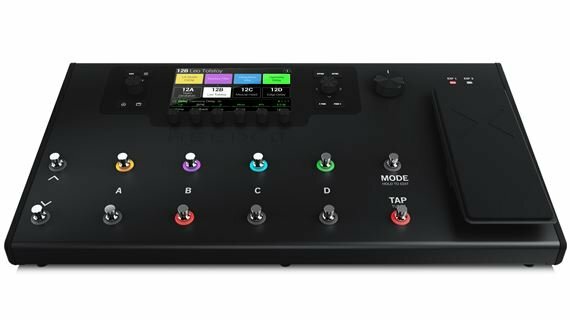 Featuring the same touch-sensitive footswitches as Helix Floor and Helix Control, the Helix LT makes it possible to keep your hands on your instrument while using your feet to control touch-sensitive footswitches for editing. Colored footswitch rings and a generously sized LCD display ensure you won’t need a GPS to find your way around and the layout is so instinctive, you’ll be tweaking your way to flawless tone in seconds. Aside from relieving you from having to bend down for every adjustment, you can actually continue playing as you make modifications. From fine-tuning an effect to rebuilding an entire patch, deep editing is a breeze using your feet via the Helix LT’s 12-footswitch interface. All parameters are accessible as you navigate using the footswitches and change values with the expression pedal, all while playing. And you know how sometimes the patch that you set up at home doesn’t sound quite the same on stage? Feel free to edit – even mid-song! Overflowing with routing options, the Helix LT affords you a wealth of possibilities. Streamlined inputs and outputs provide seamless integration with L6 Link, enabling easy one-cable connectivity between a variety of Line 6 products. Variax series guitars will benefit from instant model and tuning recall in addition to being powered by the Helix LT, and everyone enjoys the flexibility of two freely-assignable effects loops and four stereo signal paths per preset, all cleverly implemented in an efficient layout. 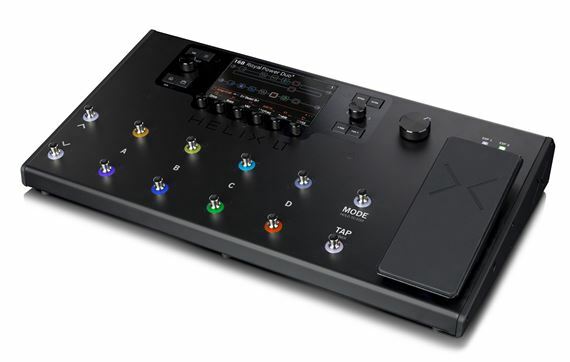 The Helix LT’s fine complement of I/O makes for easy assimilation into your live rig or your studio setup. Quite a bit, actually. The Helix LT’s chassis is compact enough to toss in your bag and robust enough to withstand the demands of the road, or the air, as this is the perfect traveling-tone solution for fly-away gigs. Sonically, there's some great stuff here. 62 Amps, 37 Cabs, 16 Microphones, and 104 Effects ensure, no matter what the gig is, your tonal needs are covered. 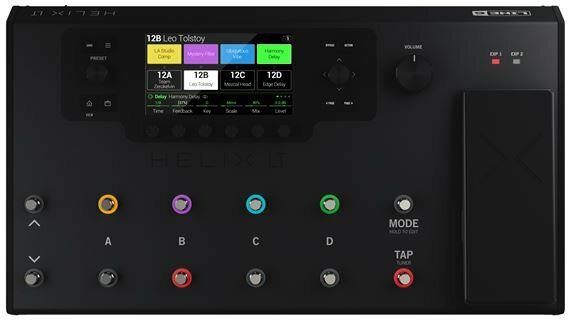 Helix LT is sure to be a favorite of Helix Rack owners taking their tone out for a spin for live shows, as the presets for all three Helix units are compatible. Of course, the Helix LT patches can be edited and stored within the easy-to-use Helix Edit software, which is Mac® and PC compatible. Your variations are endless. The Helix LT is perfect for the guitarist wanting to access the power of Helix, at a more affordable price-point. The astounding amount of tones and sounds you can get from this pedal is crazy. Any amp with any cab with any effects you want. I am blown away and haven’t even scratched the surface yet. I setup a gig rig to play on and I still can’t stop experimenting. Never been a huge line 6 fan but thumbs up Line 6 you hit the ball out of the park on this one. I play it everyday. Indispensable. Great product. I'm still learning how to make my own patches, but using the built in ones plus some packs I bought online, I have more than enough sounds to make all kinds of amazing music. I use it everyday, and love every second. I purchased this product after using a Line 6 Firehawk FX floor unit for about 3 years. Getting used to the workflow is easy and the variety of available amps and effects sound great. The upgrade from the Firehawk, was it worth the 146% MSRP difference in price? No, not for a bedroom user. It is absolutely worth it for anybody playing in a live situation. The Snapshot feature is worth the upgrade alone. Add in the multiple options for routing/input/parallel paths and you have an all-in-one unit. Recording with the supplied drivers from Line 6 is a breeze in Reaper. The ASIO Helix drivers offer practically zero latency and the sound over USB is phenomenal. This thing is great. Literally everything as described and sounds amazing. I use my Helix LT for studio and live performance and it works like a charm. I’ve done live performances on stage with it direct driven through the PA and through tubed rigs and both sound amazing. My live sound is equal to my sound on album. I couldn’t ask for it any other way. This is an awesome modeler, I run it FOH at my church and it does great. I got tired of lugging around my tube amp and pedalboard. I liked it so much I got a James Tyler variax and wow, the possibilities. I wish it did polyphonic pitch and synth, but that might come on one of the future free updates they've added a lot of stuff in the 2 years I've had for. The Helix LT is everything I hoped it would be and more. I play in an original rock band and the variety of tones I have discovered in only a few short weeks of ownership has been transformational. It’s easy to transport and easy to use. I would definitely recommend the Helix LT. I am more than pleased with the selection of amps, cab models, and effects. It has all the adjustments needed and the sound and tone are amazing! Very user friendly and the display easily understood. Anyone who plays should buy this thing! It’s next level! !